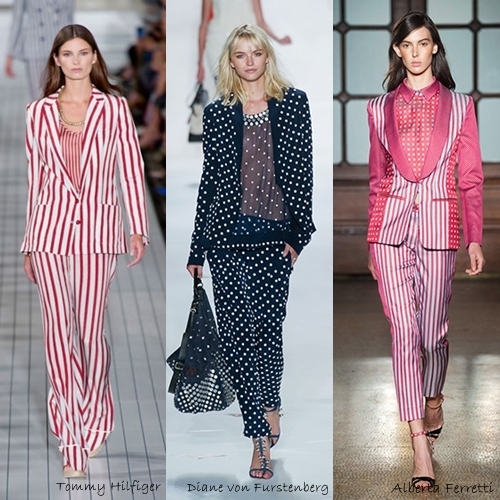 Today we are talking about one of the Spring 2013 Trends - Stripes and dots. A definite must have for the season ahead, designers have paraded lineal inspired looks all of the last season on every major runway around the world. This will be one of the bigger trends along with black and white. Enjoy the trend just be careful and wear this according to your body shape. Choose vertical stripes and they'll make you look taller. Mix stripes and dots, as you can see everything is allowed! What do you thing about this trend? Danas pričamo o jednom od najnovijih trendova za proleće 2013. - Pruge i tufne. Dizajneri, inspirisani linijama i geometrijom, predstavili su na svim većim revijama širom sveta apsolutni must have sezone. Ovo je ujedno i jedan od najvećih trendova, uz kombinaciju crne i bele. Uživajte u ovom trendu, ali budite pažljive. Nosite ove printove u skladu sa svojom figurom. Ukoliko izaberete vertikalne pruge, nećete pogrešiti jer će učiniti da izgledate više. Kombinujte pruge i tufne, kao što vidite sve je dozvoljeno ovog proleća! Da li ćete nositi ovaj trend? Bold black and white looks are the best at the moment! Love this trend and I really like Michael Kors dress. I talk about it on my blog too! Love that Oscar de la Renta gown. I personally love polka dots and stripes! Thank you so much for your comment it really means a lot to me! Blogging can take a lot of time sometimes and it's hard managing when you have so many other things to do! I will continue to attempt to do it!